Train your mission planning staff with courseware approved by the Federal Aviation Administration (FAA) or relevant NAA to license civil airline dispatchers, but have it customized for your operational needs. Jeppesen can tailor the curriculum for specific aircraft performance data, mission planning tools and procedures, and other operational specifics. Graduates can elect to take the civil FAA/NAA written, oral and practical exams leading to issuance of the Aircraft Dispatcher license. Short courses available for experienced personnel or those seeking an indoctrination course. Mission planners will learn about the duties and responsibilities associated with aircraft dispatching and acquire in-depth knowledge of theory and civil regulations. Your staff will also gain exposure into different automation tools available to help mission planning efficiency, from electronic flight planning systems to electronic flight bag tools and data. Upon completion of this program, applicants will be proficient in the following subject areas: Meteorology, Aeromedical, Emergency, Security, Communications, Air Traffic Control, Navigation Principles, Navigation Systems, Instrument Approach Procedures, Charts and Airspace, Aerodynamics, Aircraft Systems, Weight and Balance, Aircraft Performance, Aircraft MEL/CDL, Regulations, Special Navigation and International Ops, Deicing and Anti-icing, Manual Flight Planning, Dispatch Resource Management, and Practical Dispatching. The Denver-based Jeppesen FAA Dispatcher Certification Course is approved by the Colorado State Approving Agency, and the Colorado Division of Vocational Rehabilitation, for the training of Veterans and eligible dependents. Contact us today for more information regarding eligibility. Jeppesen can deliver this training at any Jeppesen facility or at a customer location. More scheduling lead time is required for graduates who wish to obtain FAA/NAA license at the end of training. Contact us today for more information. The standard course is 200 contact hours, with additional study time required. The full-time classroom course normally consists of 30 days, held eight-hours per day over six weeks. 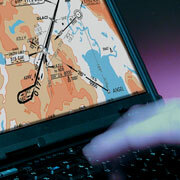 Jeppesen can modify the class structure and deliver it at any time at your location or ours. The minimum number of students is seven per class. Courses as short as 80 hours in duration are available for those with recent experience in flight operations, air traffic control, meteorology or dispatching.